Phaplu is a village in Solu Dudhkunda, it has airport and is a great starting or finishing place for your Three passes trek if you want to save money on your Lukla flight which costs 180$. Phaplu is served by daily jeeps from Nepal’s capital city Kathmandu. Most of the buses or jeeps from Kathmandu to Phaplu start their rides from Chobahil Chowk bus station in Kathmandu. This bus station in Kathmandu could be easily reached by taxi from Thamel for 400NRP. 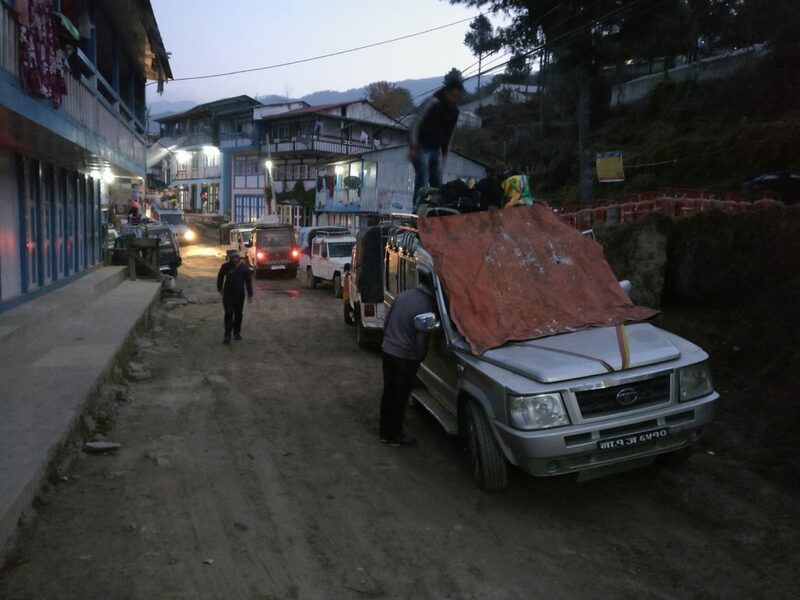 Jeeps start their long and bumpy journey between 5AM and 6AM. They arrive to Phaplu at around 5PM. Jeep drivers get ready in the early morning. Price for this 11-12 hours jeep ride from Kathmandu to Phaplu is 1600NRP. Jeep driver stops every 2-3 hours for snacks/lunch/breakfast/dinner/tea. The places where it stops are local and prices are friendly. I recommend to try milk tea, boiled egg and Dal Bhat. In the evening, when you will reach your destination you will be tired. Phaplu town altitude is 2400 meters above sea level and it is already good to begin your acclimatization. Kathmandu to Salleri jeep is the same one as Kathmandu to Phaplu. Salleri is a little bit below Phaplu and all of the jeeps going to Phaplu will pass Salleri. You might want to stay in Salleri as it is a bigger place and have more shops and accommodation options. One of the stops for food. Best hotel in Salleri is The Hill view Guest house. They offer rooms for different prices. I was alone and paid 300NRP for clean bed without shower. From Phaplu to Namche Bazaar you will need to cover a distance of around 60 kilometers. For this reasonably fit hikers will need 3 days. If you are long distance runner with light backpack you can do it in 2 long days. 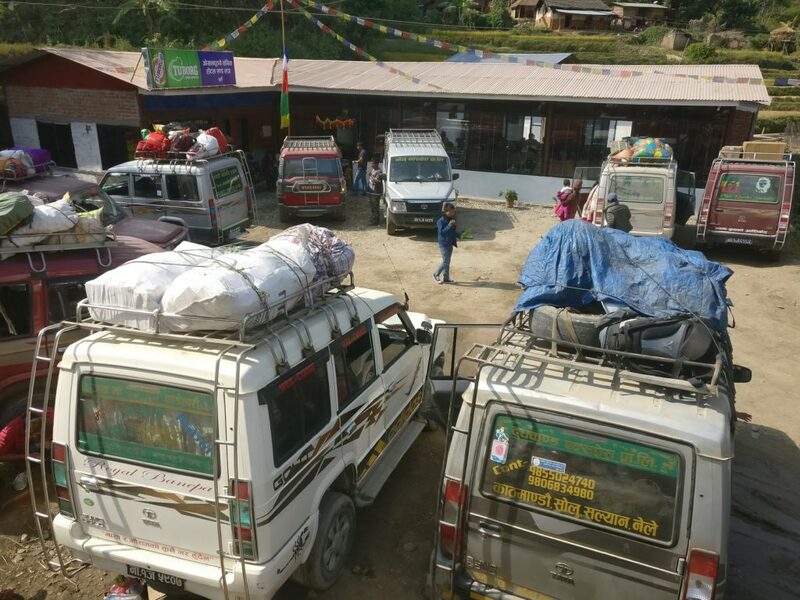 Phaplu or Salleri to Lukla will take 2 days for normal people. Phaplu has a good mobile internet for Ncell. You might want to send your photos, chat with your friends. Around 5 kilometers away from Phaplu mobile data stops working and you will get reception back only near Lukla. Check out the article about mobile data on EBC trek. Hi Joseph, thank you for posting this great information. I was wondering is the trail well marked? 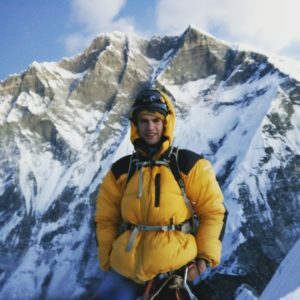 If we planned on taking 3 days to get to Namche Bazaar where would you recommend staying on the trail? Are there tea houses or places to stay or do you need a tent? Thank you!! The trail is well marked. If I remember correctly it was orange spray paint circles on stones and trees. Anyways, have maps.me, GPS or paper map with you. I took a bus from Kathmandu and arrived in the evening. The same evening I reached Ringmo where I stayed at Center Sherpa Lodge. Next day I went from Ringmo to Bupsa where I stayed at Sundup lodge. Third day was from Bupsa to Phakding and the fourth was very short to Namche. But if you stay in Phaplu the first night instead of walking directly to Bupsa you could do it in days. Perfect! Thank you for the great detail and information. Cheers! hi, Did You buy or book tickets for bus or jeep before or just came in the mornig to Chobahil Chowk bus station?